Goodby Silverstein & Partners is introducing a new ad campaign for Cisco —the “Space Hotel.” The new campaign, featuring a 360 video virtual tour and product demo documentary produced by Gentleman Scholar, illustrates how Cisco Spark’s bold collaboration platform allows teams to make the impossible possible. For this digital campaign, GS&P brought together an interior designer, a space explorer, an astronautics professor and a travel expert to answer the question: With space tourism upon us, where will we stay? The result is the Space Hotel - an immersive 360 video tour of a galactic hotel that might only be a few years from reality given the technology already at our fingertips. The hotel includes a lobby, bedrooms, a dining area, an observation deck and the universe’s first zero-G swimming pool. The other collaborators of the hotel are interior designer Nicole Hollis, principal and creative director of NICOLEHOLLIS; Anousheh Ansari, the first female private space explorer; and Brian Kelly, founder and CEO of The Points Guy. 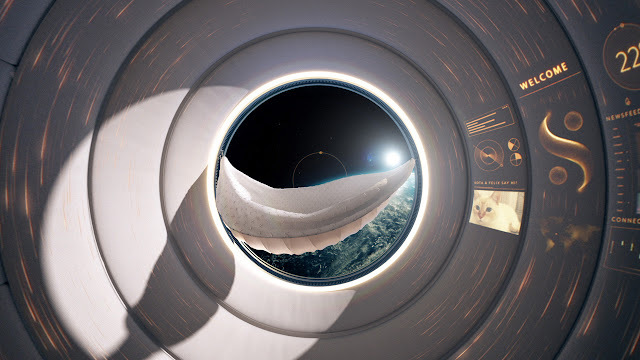 The Space Hotel 360-degree video experience and a short film about its creation are housed at http://cs.co/SpaceHotel360YT. Each contributor has quite a bit to say, as over 20 hours of footage was gathered of them sharing sketches, ideas and refinements using the collaboration tools all while on three separate continents. The digital campaign is a continuation of Cisco’s campaign “There’s Never Been a Better Time,” which GS&P introduced in May 2016. The platform’s perpetual optimism fuels Cisco’s drive to make formerly outlandish ideas, like a space hotel, reality. —Ad: "Cisco Spark: 360 Space Hotel Tour"